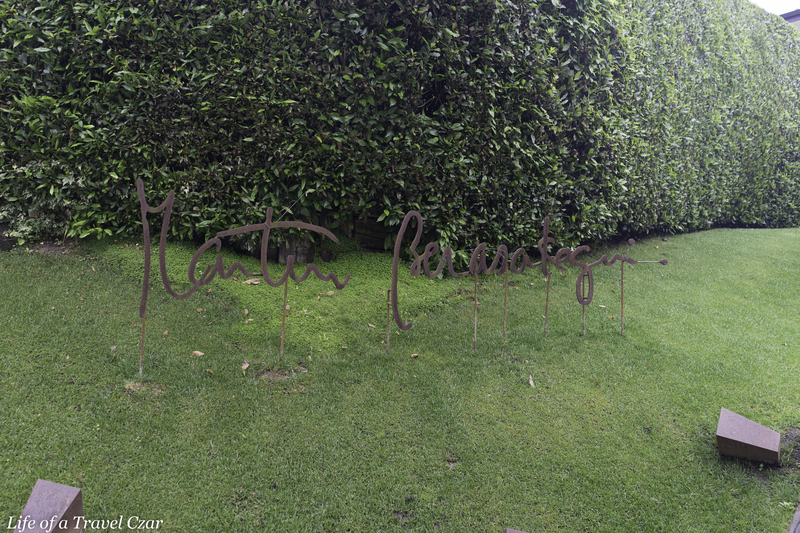 I arrive at Martin Berasategui and the restaurant is situated in among beautiful leafy surroundings with a lovely signature swirly logo of the name placed in the front lawn to welcome you to the restaurant. 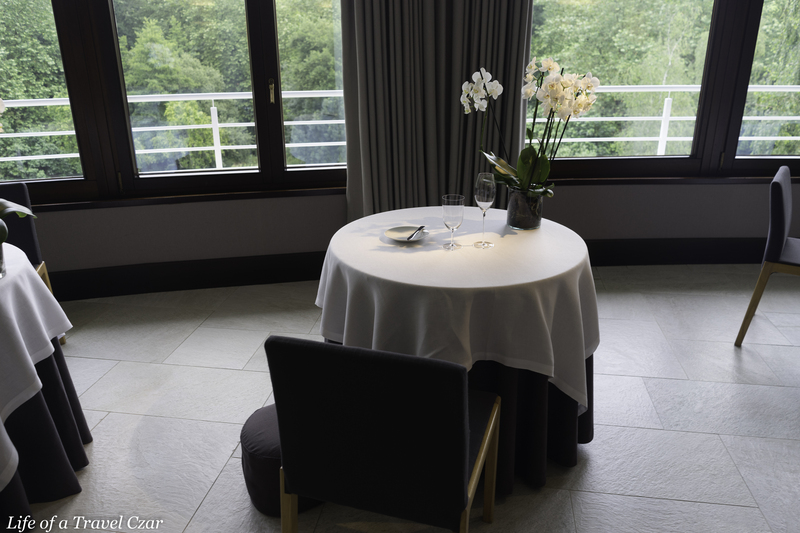 The service is attentive and I am seated in the main restaurant which has beautiful views of the leafy surroundings. I have a lovely table with sensuous dark brown/purple chairs and table skirt with a white table cloth and a lovely white floral arrangement. After being seated, I am introduced to the menu. 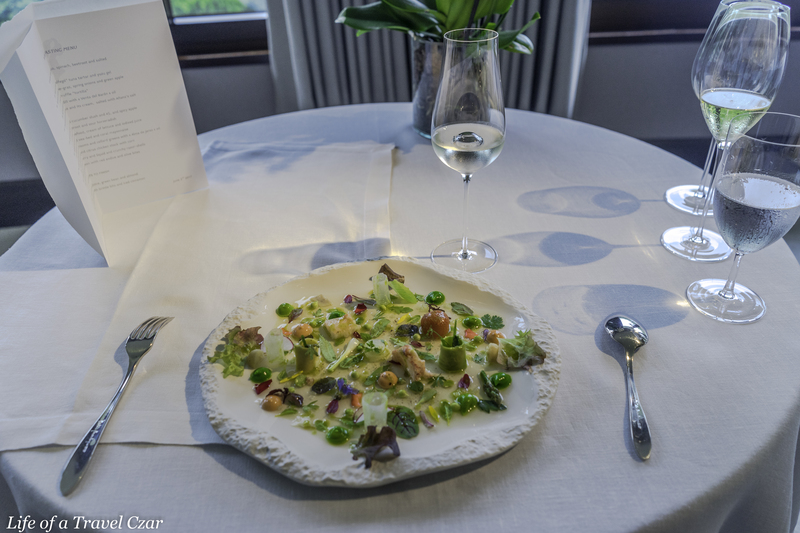 There are two options; an à la carte menu and the Great Tasting Menu; which is a tasting of some of Martin’s great dishes and new creations. Each dish has a year next to it indicate the year it was created. The oldest of these dishes dates back to 1995. I meet the sommelier, Valentina, who discusses the wine pairings with me. 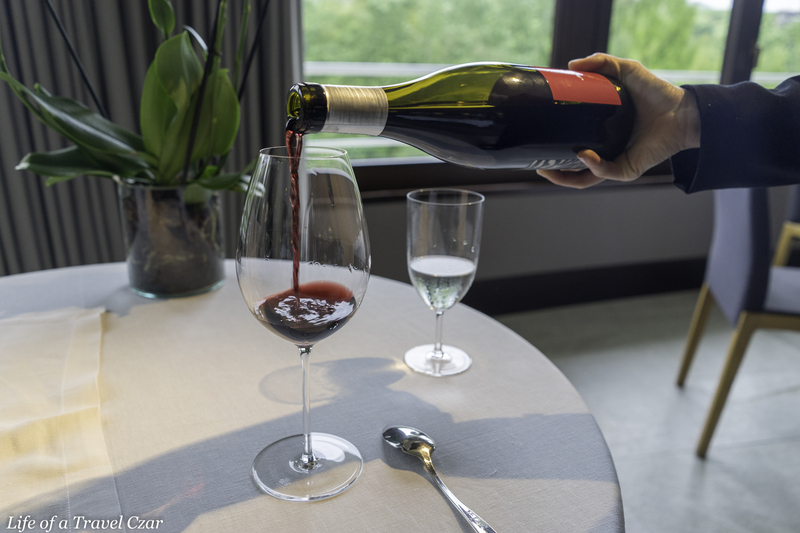 She is simply amazing; I opt for a fully matched pairing (a wine for each dish) and I outline some broad parameters on wine preferences so she can tailor the matching to suit my tastes. A selection of freshly baked breads are brought out. I choose the Blue cheese and anchovy bread and a more plain bread for the butter tastings. A beautiful array of butters are brought out to pair; Beetroot, Salted and Spinach and Mushroom. The mushroom is rich and earthy, while both the beetroot and spinach have a colourful aesthetics style and the salted butter is stands on its own. The dish is a contrast of textures and mouth feels. The rhubarb crunch is dry, while the tuna is moist with a light chill. The crunch of the cracker and the light jelly-like tuna texture is a dream. The tuna also has a natural salt flow to it for flavour with a touch of citrus from the yuzu. This dish is just a mouthful but its a nice one to wake-up the palate. The background tune I have used is “In Between Days” by The Cure – I don’t own the rights to the song. I opt for an aperitif which is Cava from Spain. This also pairs with the first course. The Cava has beautiful floral and green apple aromas. On the palate it is well balanced with good fruit flavours, acidity and notes of toasted bread and lingering honey notes. The acidity and sweetness does pair nicely with the tuna cracker. The rich smoky eel has an intense salt hit which balanced by the sweet tartness of the green apple. 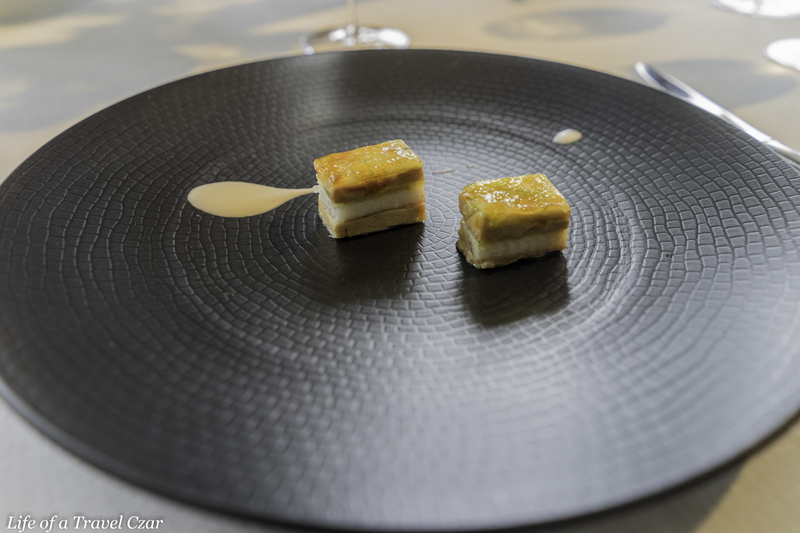 The candied sugar top adds a textural contrast with a glassy crunch and there is a little bite from spring onion cream to balance the sweeter flavours of the mille-feuille. 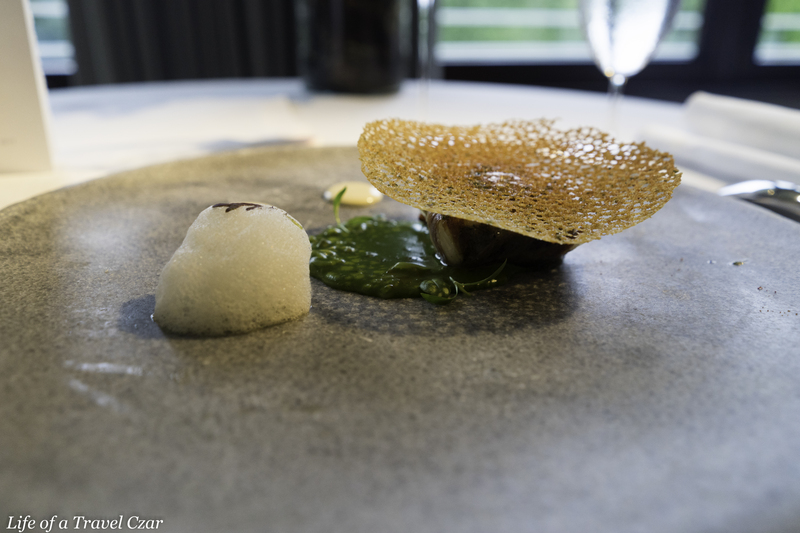 This is a dish which reflects the “balance” every chef should strive for – I am not surprised it has been a favourite since 1995. This dish is paired with a riesling from Costers Del Segre. The vineyard is about 1,000m above sea level and soils are dominated by clay and limestone which provides a good climate for cold climate grape varietals such as this riesling. 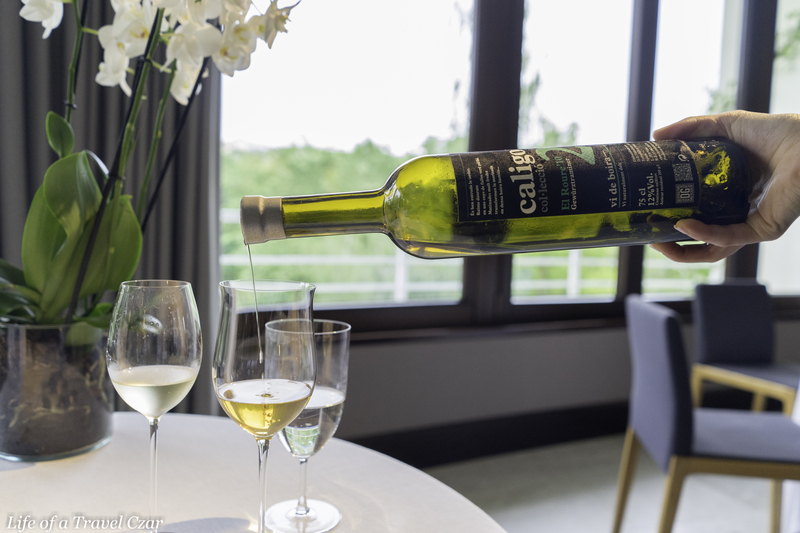 The wine is from the Catalonia region, on the north-eastern coast of Spain. 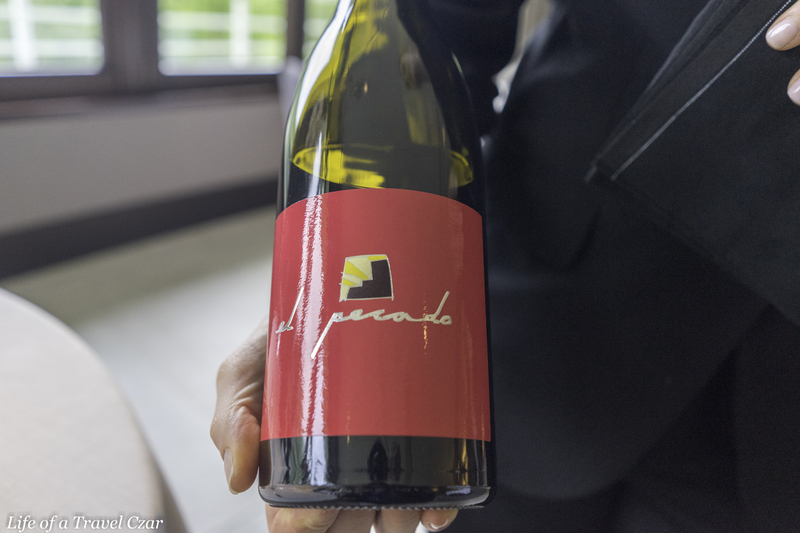 It has very vibrant aromas of lemon, floral notes and exciting fresh minerals. 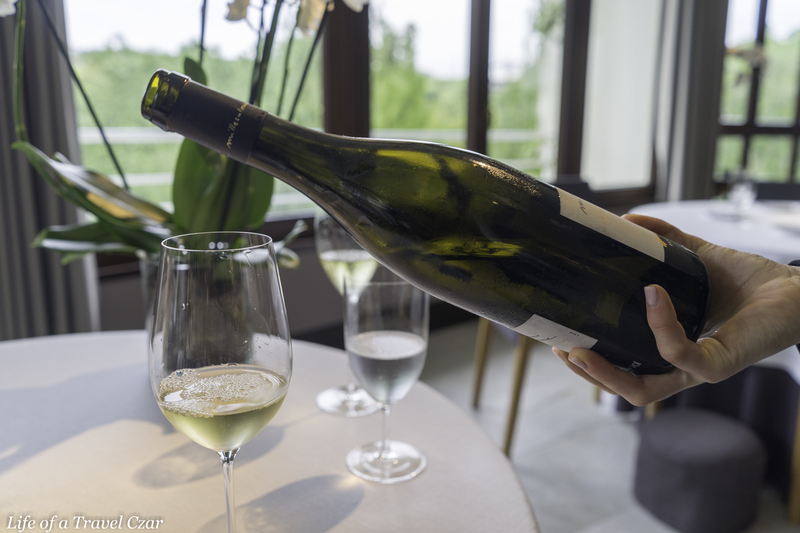 On the palate it is very dry with the good flow of citrus fruit and pineapple, the bite of ginger notes and a mild salinity minerally flow stemming from the limestone. The sweetness and acidity are perfect for the dish. It cuts through some of the richness in the eel and the sweetness balances some of the salt content of the dish. It is a nice simple pairing for the dish. This ham and truffle tortilla is like an omelette style dish with truffle. 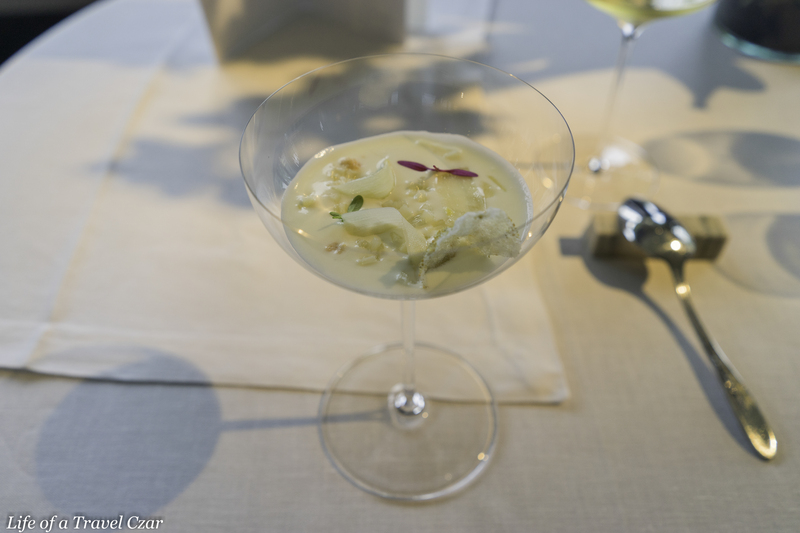 There is reduction of broth jelly (ham and truffle) at base of the dish and integrates very well into the dish. The broth provides an additional dimension of texture and flavour intensity to the dish. 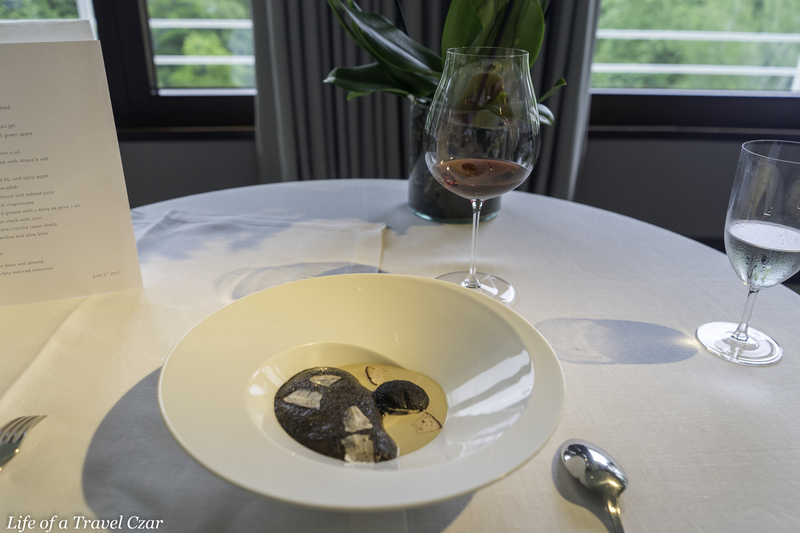 The dish is nicely executed with the salt of the ham and the deep earthiness of the truffle pairing effortlessly. This dish is paired with wine from volcanic region in Sicily. The vines are planted at base of at an altitude of over 1,000m above sea level near Mount Etna (a highly active volcano) where occasionally there is no harvest due to the fact it is a live volcano. In fact I am told they only make c.1,000 bottles and it’s difficult to do more as volcano occasionally kills the grapes. On the nose this wine displays beautiful citrus aromas with the lovely mineral notes. 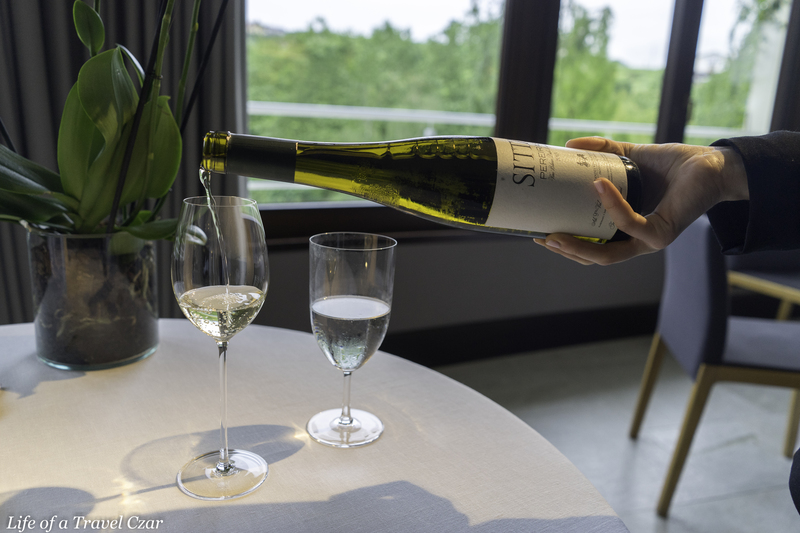 On the palate it is dry with strong citrus flavours which linger, beautiful mouthwatering acidity flowing from the strong minerality of this wine. 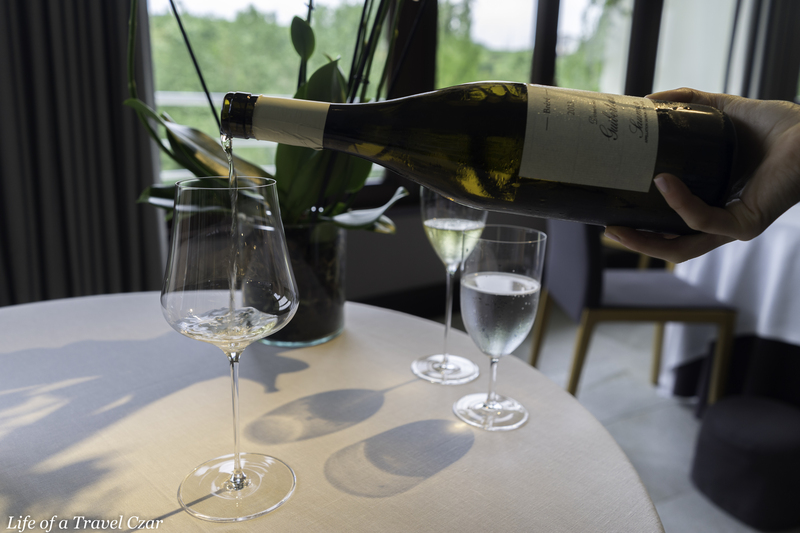 There is real freshness to wine in the finish, it’s not quite describable, but its a mix of purity and minerals that is (possibly) due to the lava and the altitude. It is a very interesting wine indeed. The wine’s acidity is perfect for the richness of the dish. The clean pure mineral notes of the wine do pair nicely with the mineral salts of the ham. Again, it is quite a well rounded pairing. 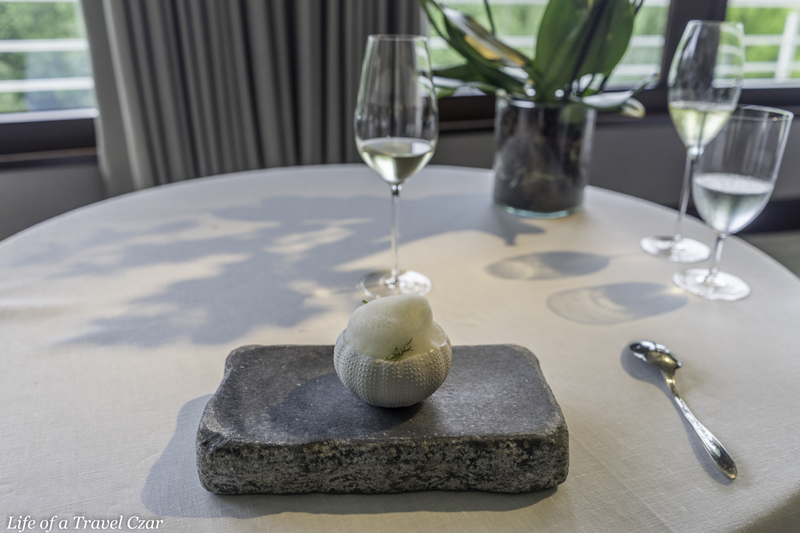 This dish definitely ticks the aesthetics box with the foam; the mini shell like pot and the stone board are a lovely touch. 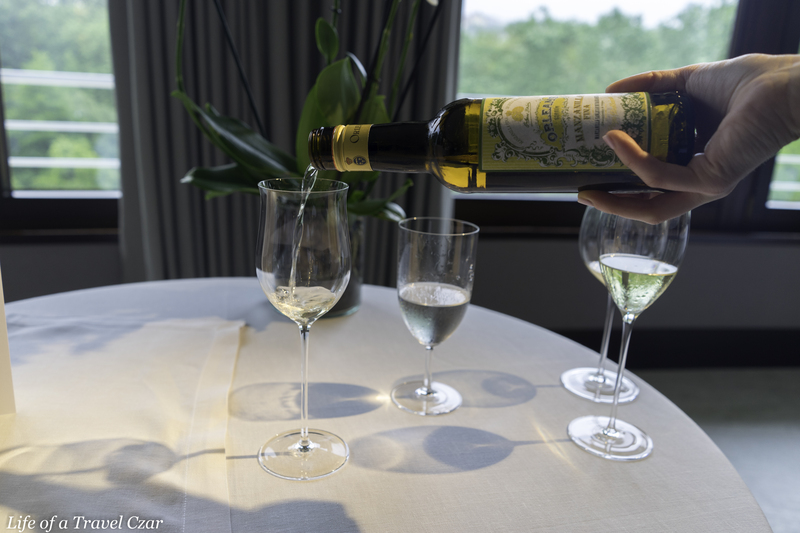 The dish has Venta del Baron oil, which is one of the world’s best olive oils and is actually from Spain. It is infused into the foam which sits at top a white mini pot. Underneath the foam is a rich combination of sweet red prawns of the local area, a rich shellfish bisque sabayon and some beans. The dish is rich, full of natural seafood flavours, the strength of the oil and the herby overlay of dill. We go from volcanic heights to ocean depths. This wine is from a vineyard close to the ocean. In fact the owner has deep 19m underground in caves which he stores some of his wine among the sea shells and algae. The vineyard is c.150m away from the Atlantic Ocean on granite soils, where the atmospheric salt and ocean spray on the grapes which deposit salt on the skin of the grapes and through the vines. The wine has beautiful rich stone fruit (think about fresh white peaches and nectarines with maybe even a touch of honey) flavours. On the palate the wine displays rich flavours and well balanced acidity. 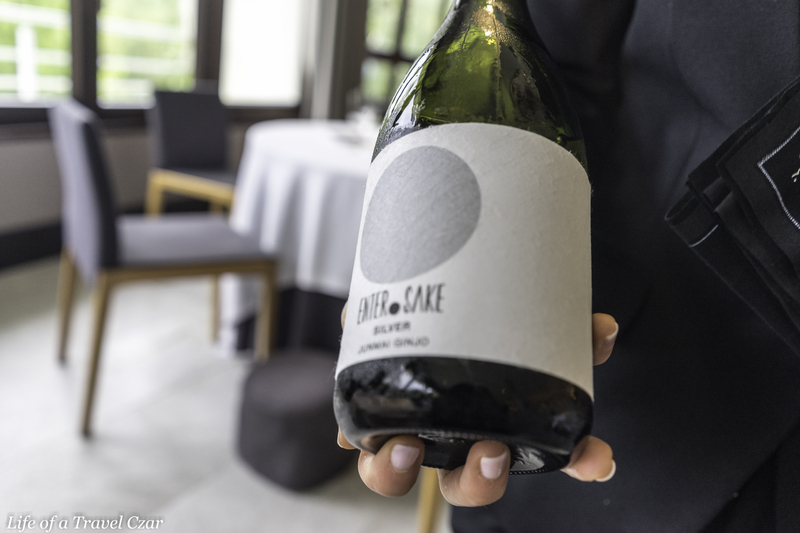 The salinity leaves a lasting imprint on this wine – this is a very different Albariño for sure. The wine has a particularly long finish with a broad mix of bitter notes, floral blossoms and honey. Its an eclectic mix of salt, sweet, acidity and minerals. The red prawns are sweet and the dish is rich with the sabayon and olive oil. 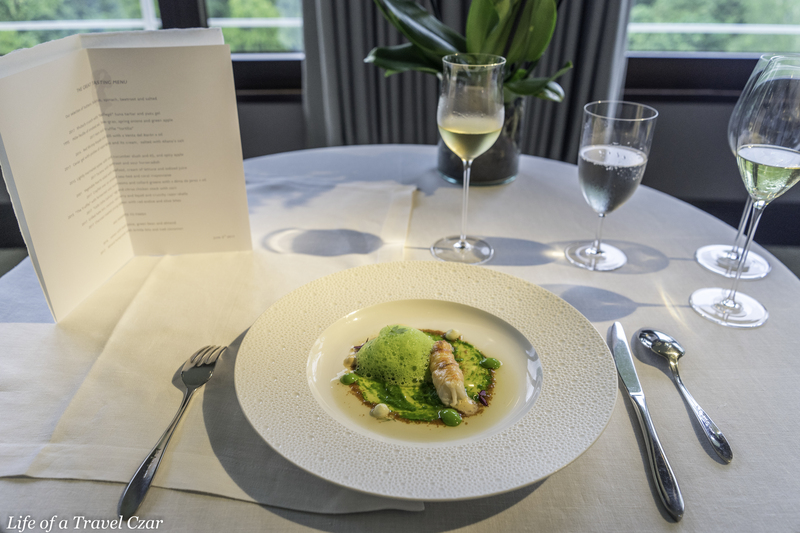 The wine has sufficient acidity to cut through the cream and has a level of salinity to balance some of the natural sweeter elements (prawn) of the dish. 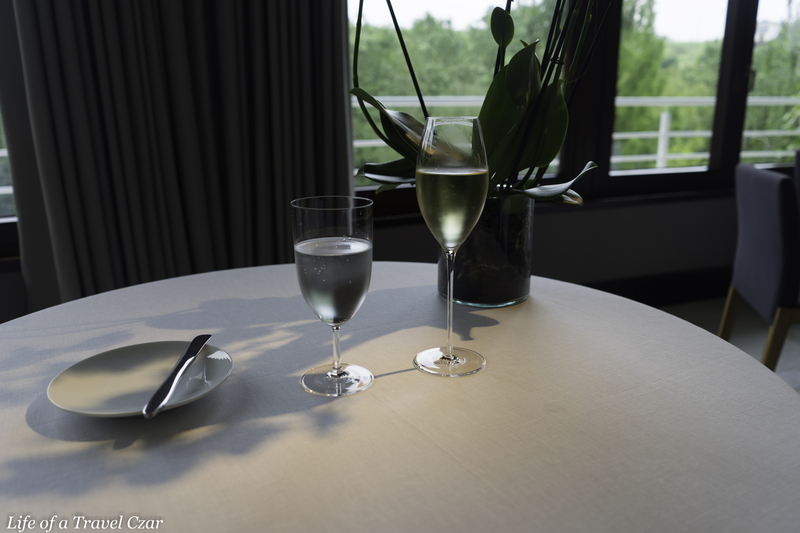 I found the purity of the wine (mineral notes) also doesn’t detract too much from the key elements of the dish. I will describe the dish a little as it may be difficult to discern from the photo. There is caviar mixed jelly on the bottom of the glass. The jelly is from a cod (essentially a reduction of cod fish broth into a rich gelatine). This is then topped with white asparagus cream and picked veggies on top. First we have the salty rich sea flavours of the caviar and the sensuously rich jelly of the cod. The bottom has this intense rich minerally and salty flavour which is a dream. This is balanced by the mild white asparagus cream. The cream has some salt such that the contrast isn’t too stark. The pickled vegetables are crisp and clean and cleanse the palate. 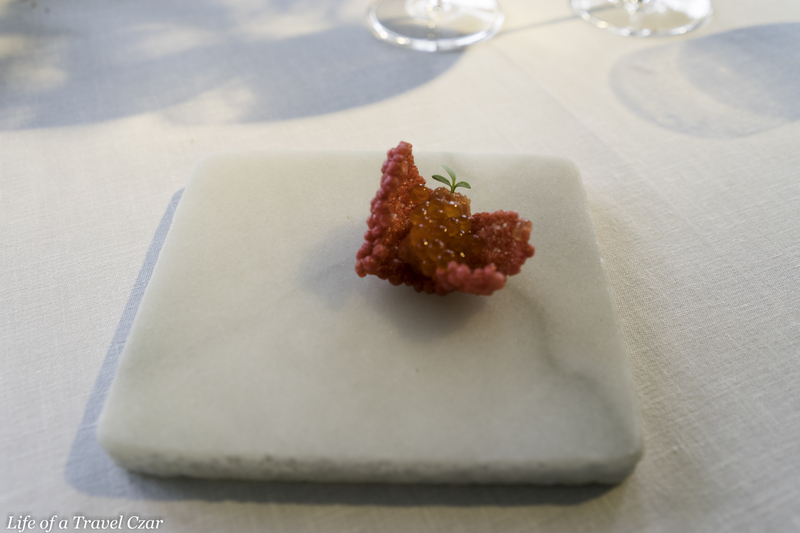 There is a cracker on top for a textural contrast and adds a nice touch to the dish. It is a dream to taste. The dish is paired with a Chenin Blanc from the Loire Valley. 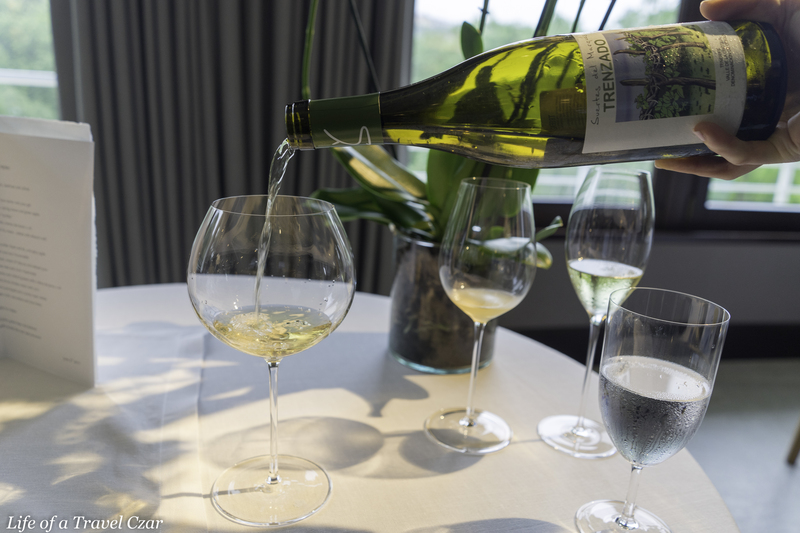 The wine benefits from humidity and warmth of the Loire Valley. There are beautiful green apple and oaky aromas. The wine has a beautiful texture on the palate with a mix of citrus and peach flavours. The apple doesn’t seem to to continue from aroma to palate. All in all; its a well balanced wine; with a good burst of minerality, a solid acid structure and citrus base for a lovely drinking experience. I won’t comment to much on the pairing other than this; good citrus flavours and acidity paired with caviar and cream…. I don’t think I need to add anymore. 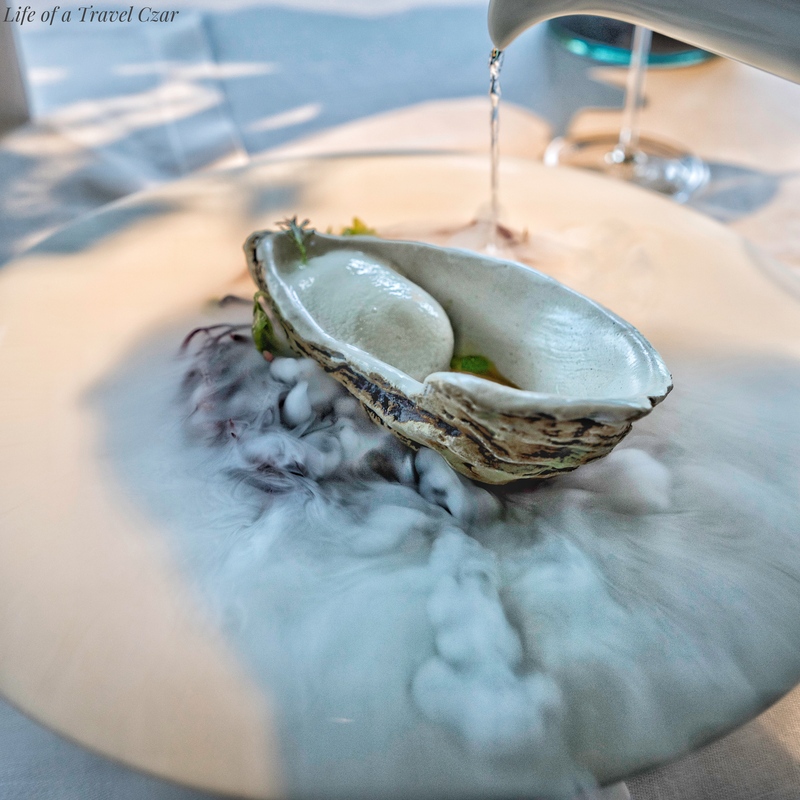 Its a dish which about theatrics – The dish is brought to the table with dry ice poured in the base of the dish for a foam and bubble effect. The background tune I have used is “Good Enough” by Dodgy – I don’t own the rights to the song. 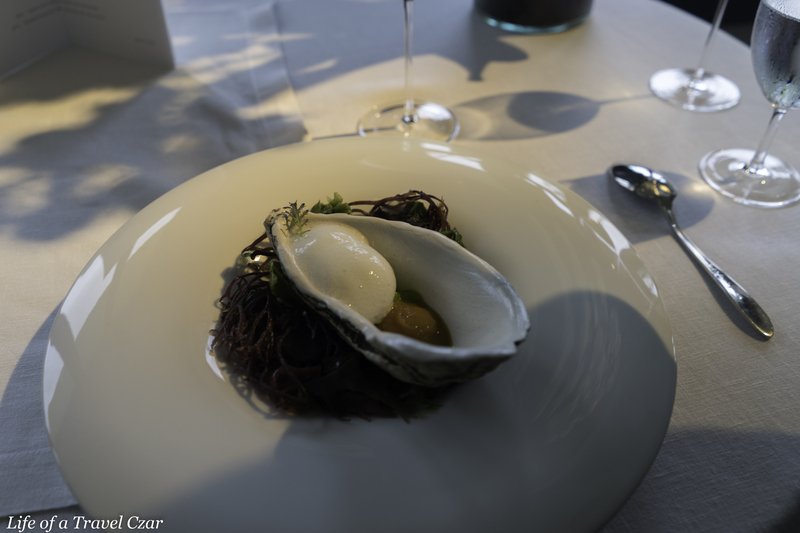 The oyster is rich with its natural sea salt flavours and is imbued with K5 wine (made from Hondarrabi Zur grapes). 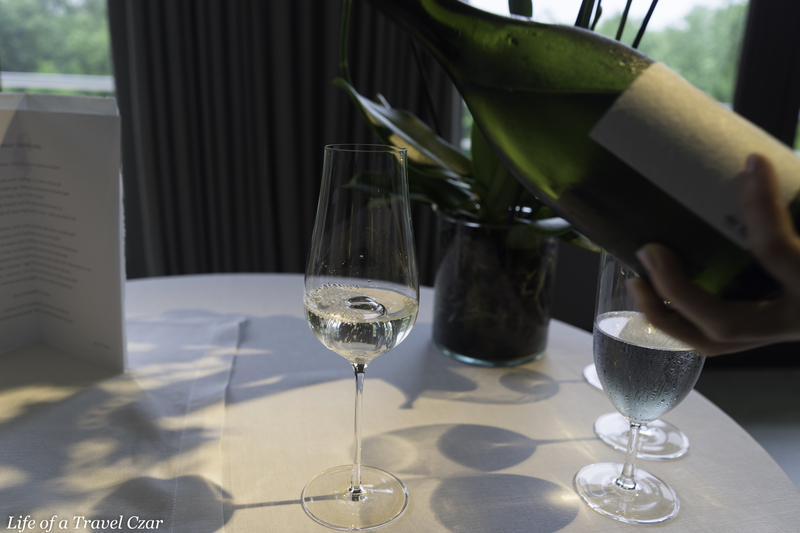 This pairs with tart spicy green apple (which has hints of citrus notes from yuzu) and refreshing cucumber ice. The sweetness, tartness, coldness, spice and salinity flows through this dish in unison. It is the art of culinary construction. This particular wine is from the Uco Valley in Medoza, Argentina. The wine is from another high altitude vineyard and is unfiltered so it has a murky cloudy look in the glass. The wine has little notes of apricot, some peach and herbs on the nose. On the palate it tastes like a very tart tropical fruit punch with an undertone of acidity and hints of lemon in the finish. Its definitely interesting and very different style of Torrontes. 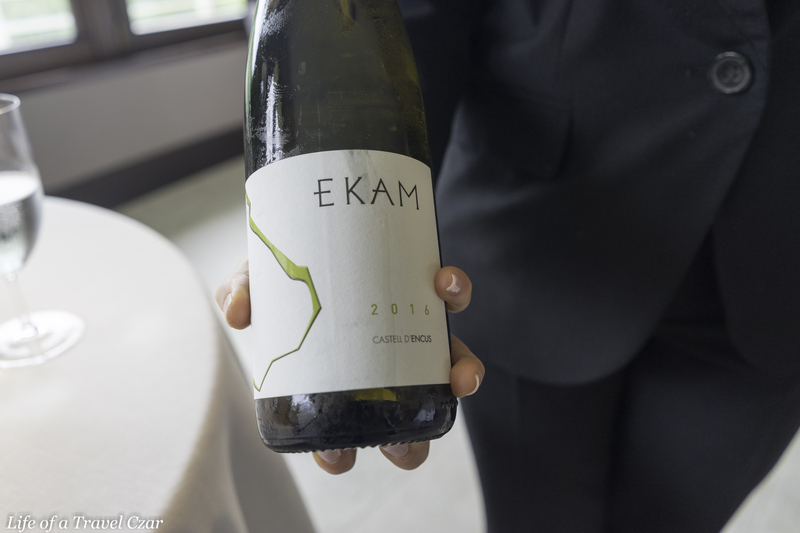 The pairing is rather interesting; there is good tart fruit to contrast with the salinity of the oyster and a decent acidity to cut through its richness. The wine seamlessly integrates with the apple too. 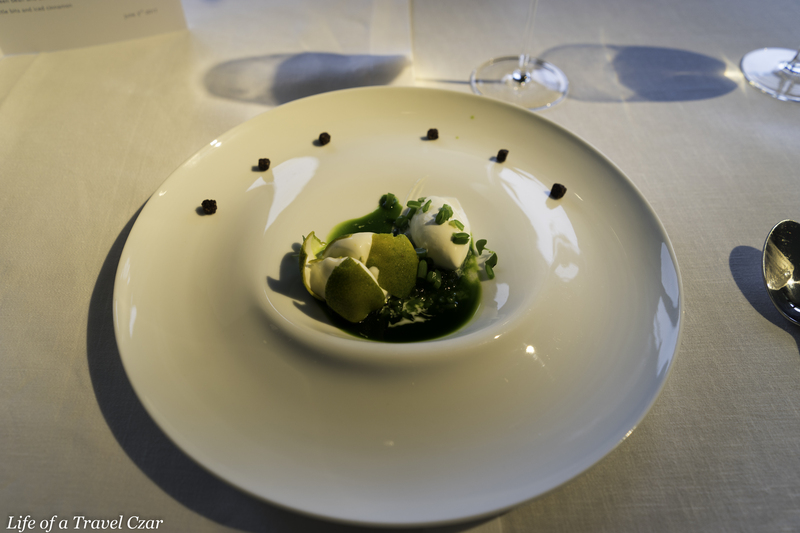 The dish is like a work of art. 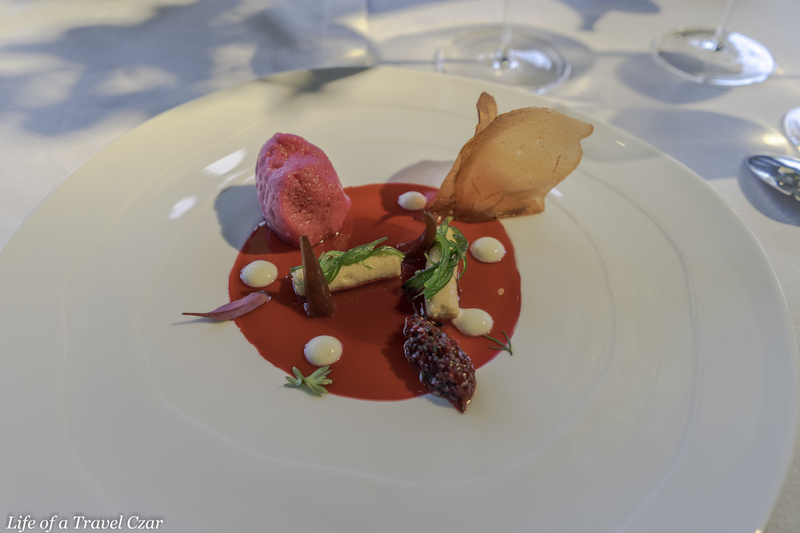 The beetroot jelly disk, the rhubarb foam / emulsion, a sugary beetroot crisp, tamara (little rolls of Greek-style salmon roe), diced beetroot with a tangy vinaigrette with dots of horseradish cream. The tamara adds a real rich saline streak to the dish to balance sweetness of the beetroot. The radish cream is mild but has bite and heat to work through the integration of salt and sweet. 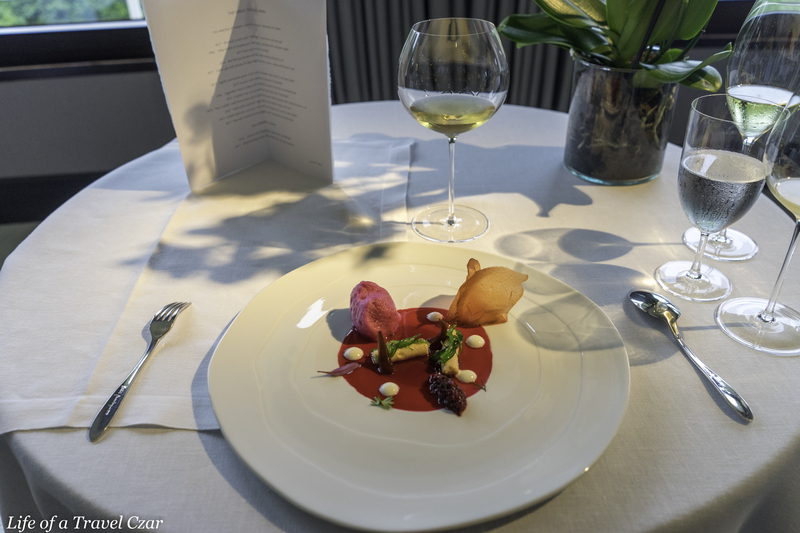 There is an earthiness in the diced beetroot which adds another dimension to the disk, while the beetroot crisp adds a nice textural contrast to the jelly and cream like textures of the dish. Its ying / yang style of dish. The next wine is from the Tenerife (Canary Islands). The wine (like the Albarino earlier) has good salinity and earthiness due to proximity to Atlantic Ocean. The wine has good citrus and earthy notes. It’s has a refreshing flow on the palate; with an indescribable texture. There are beautiful stone fruit flavours with some pear and a nice bit of lemon supported by a zesty acidity. The finish doesn’t disappoint with nice saline, bitter lime and earth notes. The wine’s mouth-watering acidity is the right prescription to balance the richness of roe and sweetness of beetroot. The earthy and saline notes in the finish also triangulate the beetroot and roe flavours. 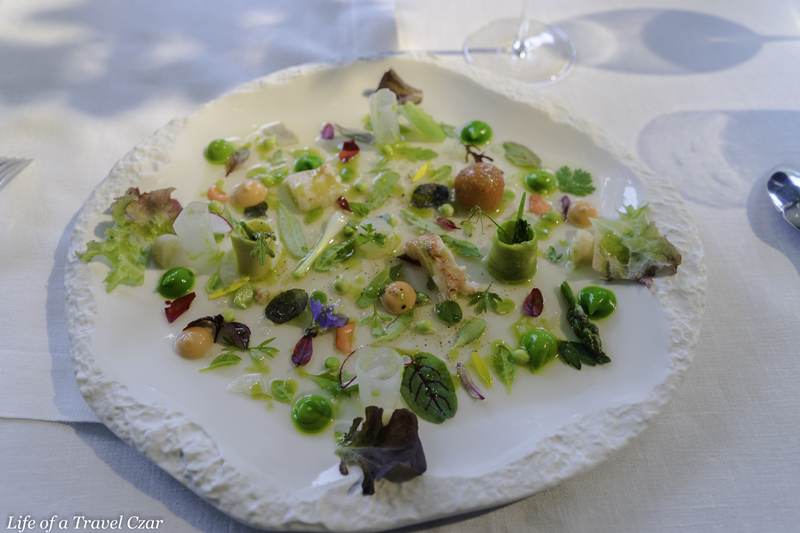 It’s like a little oasis on a plate; Micro herbs, asparagus spears, peas, avocado, lettuce, petals, crescents of radishes, tomato ball, green peas, little chunks of lobster, macadamia nuts with droplets of lettuce cream and iodised seafood cream. This is all delicately placed on a bed of tomato water jelly. It’s a mix alright; there is the soft rich creams, the delicate tomato water jelly, the crunch of the macadamia, the leafy lettuce and herbs, the juiciness of the tomato ball and then the lobster. 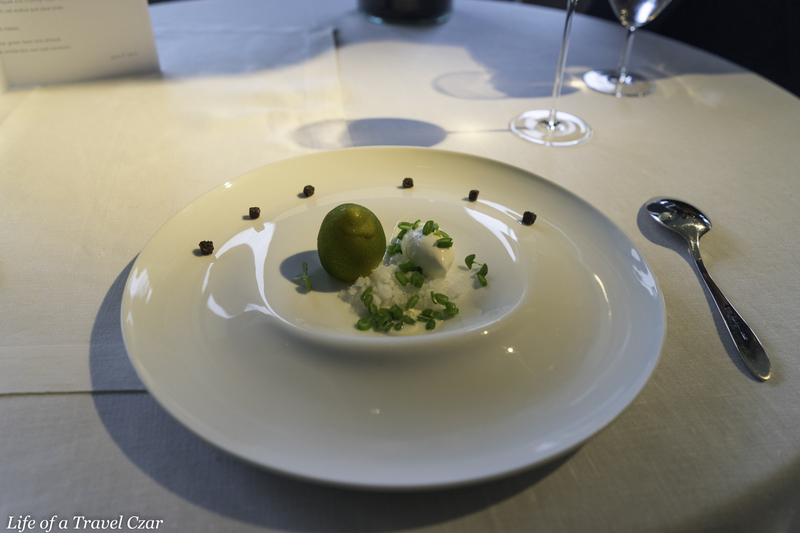 It’s a dish a delicateness of composition and every flavour is positioned not to overpower the other. The Enter Sake Silver is a Ginjo sake. On the nose it displays honey and light floral notes with a hint of cherry. On the palate it has decent punch with hints of melon, light cherries and tropical fruit. A very nice clean finish and smoothness of flow at the end of the palate. I was nervous about this dish when I saw it on the menu. It was a soft delicate dish and I was wondering what wine they would pair it. Valentina weaves her magic again and delivers a Sake for the matching. 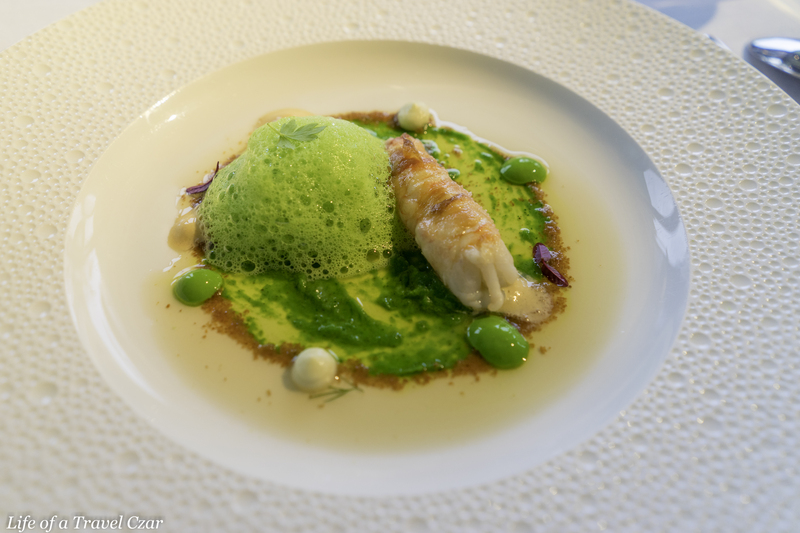 Its perfect for the dish; a clean taste so as to not interfere with the delicate flavours of the vegetables and tomato jelly but some acidity to cut through lobster. 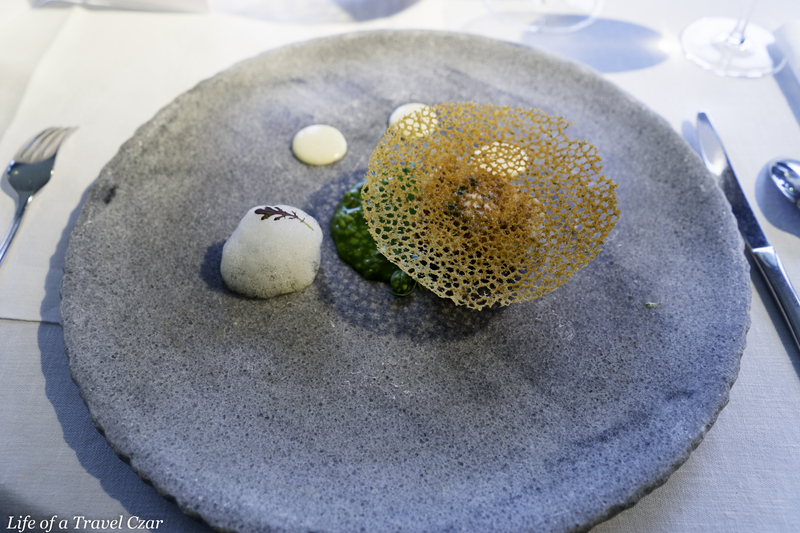 The dish is precision perfect in its construct; spider crab broth, little ground shrimp in base of the broth, seaweed base. 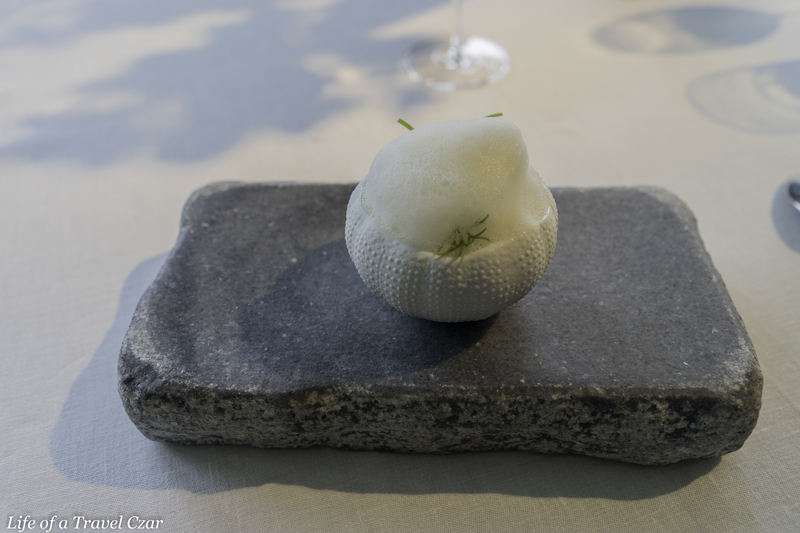 There is “sea urchin” coral mayonnaise, fennel cream and seaweed cream. The crayfish is the main showpiece and is wrapped in ham. The sweetness of the crayfish is paired with the deep minerally salt of the ham. The crayfish is sweet. The deep distinctive salt of the ground shrimp and seaweed makes for almost an ocean taste. The creams are light and have and each of them have an interesting; sweet (coral), mild (fennel) salt (seaweed) flavour in their own right. The dish is paired with a Sherry from Andalucia. The sherry is quite bitter and aromatic. The bitterness due to youth of the grape and the fact it is quite a small grape. It has had limited exposure to oxygen resulting in good sugar. On the nose there is a saline aroma with hints of deep lemon. On the palate there is bitter lemon curd flavour with hints of toasted bread notes with a sweet streaky finish. Its quite complex; there are a lot of flavours and notes on the palate to work through; its a beautiful sherry indeed. It is an interesting pairing. 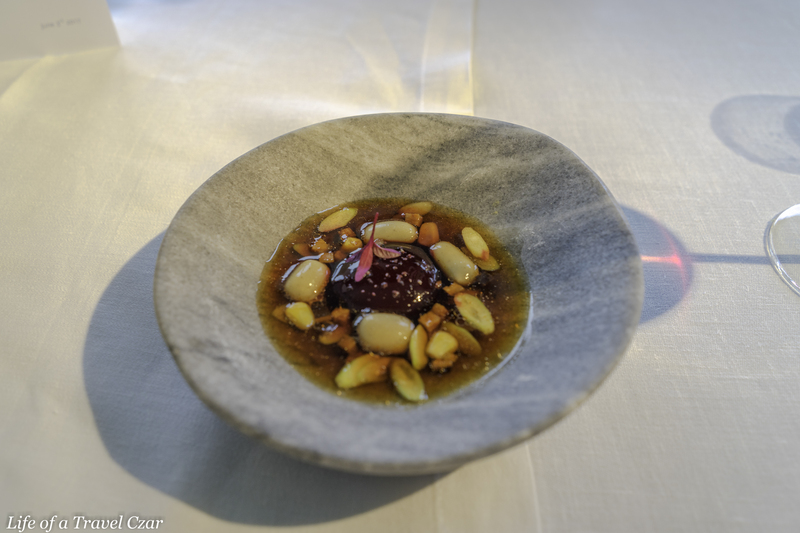 The bitterness of the sherry stands with sweet and saltiness of dish in some way. 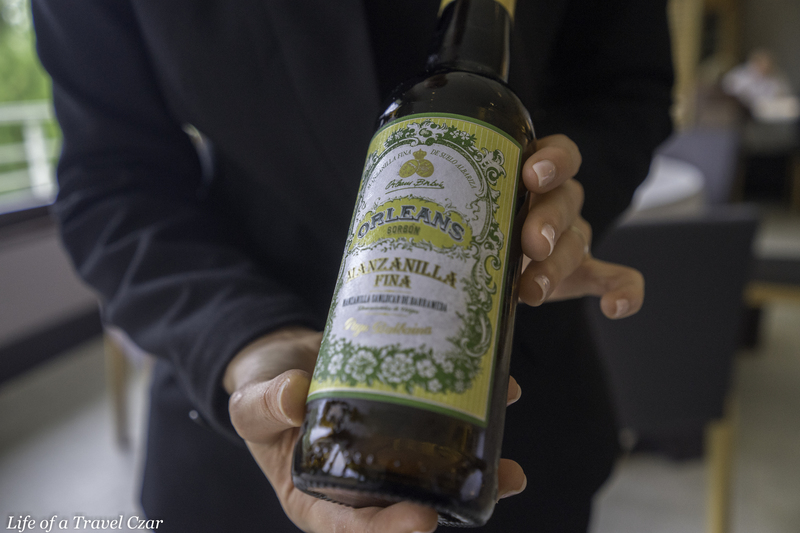 The complexity of the sherry does help work through some of the components of the dish; the crayfish is sweet and the sweetness in the sherry’s finish does pair well. The acidity and bitterness does also work with the richness of the crayfish and combine well. The salt from the seaweed and mild sweet spice intertwines beautifully with the sherry richness as well. 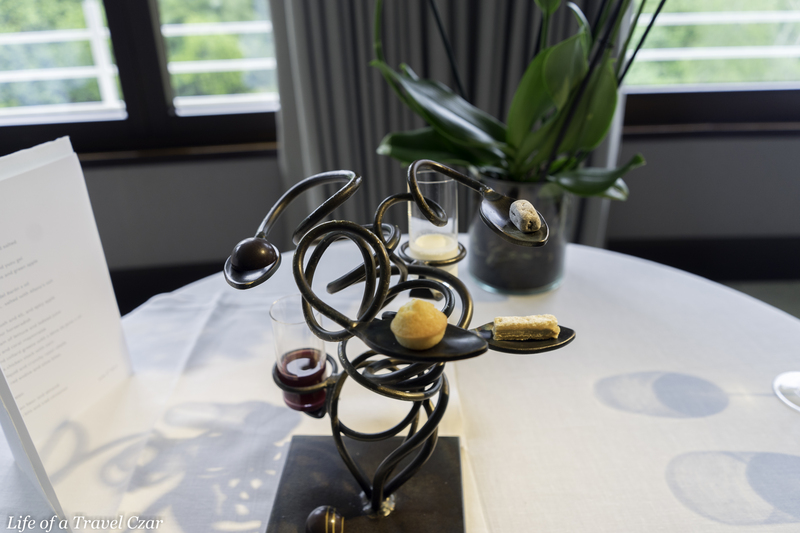 The dish is called the truffle, however here’s how its constructed; a buttery foie gras mixture with black mushroom powder made to look like a truffle. There’s a lovely light mushroom foam on top and underneath the initial layer there is some cabbage and even a cockscomb for a little difference. There also fermented mushrooms scattered across the dish. I taste a little uniqueness in the foie gras mix and ask the waiter about it; he informs that the foie gras mix has some lamb brains mixed in, so there is a little offal in the mix. 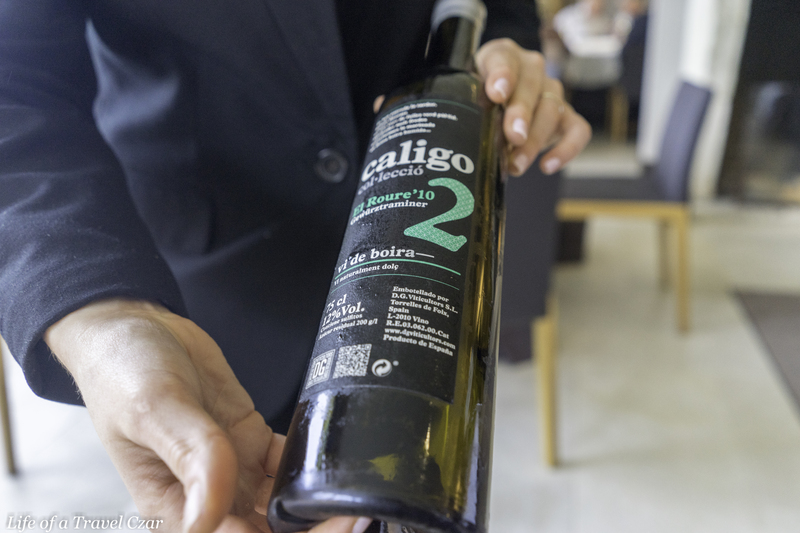 The olive oil weaved through the mixture is another highly acclaimed one; Alma de Jerez which infuses a strong aroma and flavour into the dish. The dish is defined by the richness of flavours and earthiness. The textures are lovely; the foam, the softness and the buttery textures and the cockscomb. 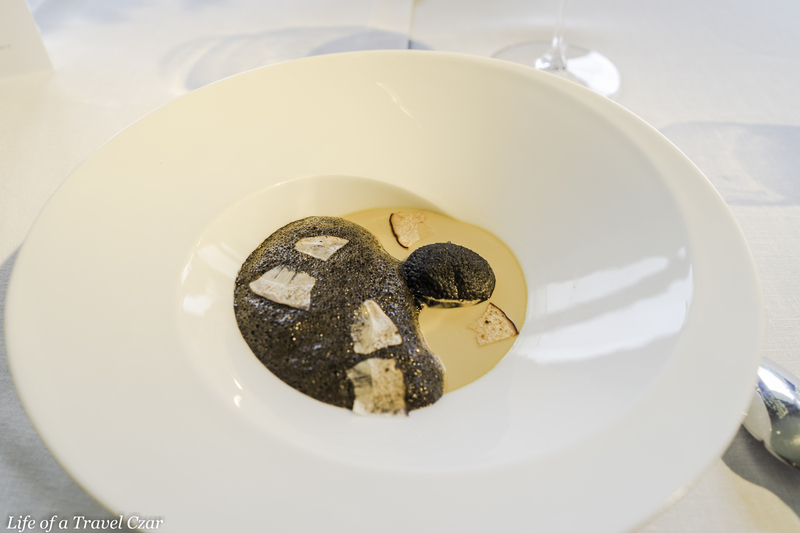 The dish has excellent depth of flavour and certainly mimicked the truffle shape, texture and style very well. 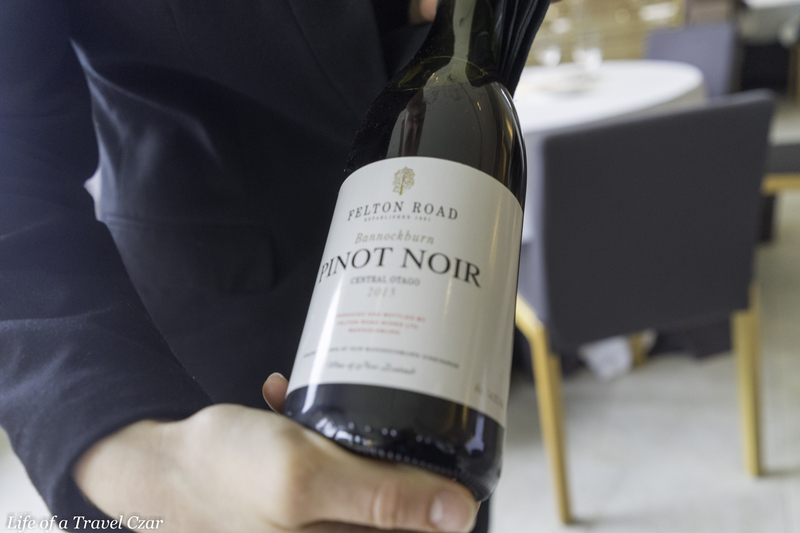 It’s Pinot Noir from New Zealand – very close to home. 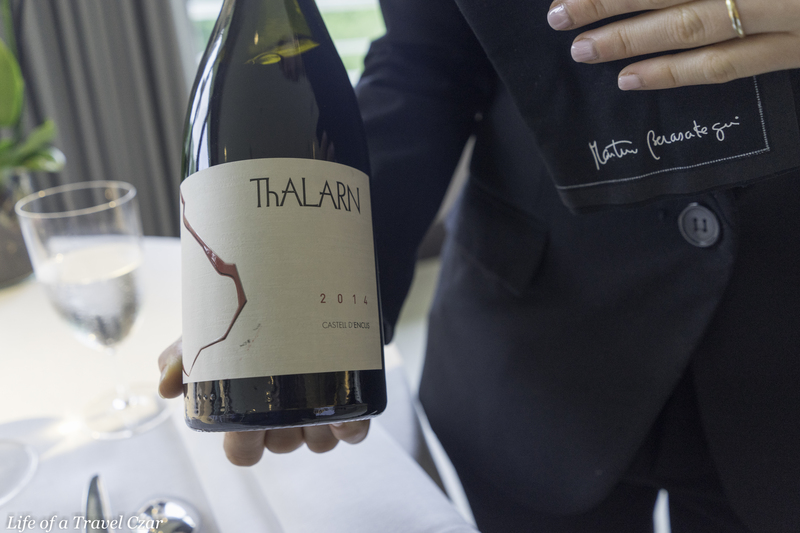 Its a relatively young Pinot with beautiful cherry and floral aromas intertwined with sweet spice. On the palate, there are rich dark cherry flavours with hints of herbs, sweet spice. The fruit is balanced by some good fresh acidity and beautiful tannins in the finish. The pinot was a good choice for the dish; the acidity cut through the richness of the dish; the strength of the fruit was able to battle the strong flavours of the foie gras mousse (which like how you would pair a quince paste or compote with pate) and the tannins were perfect for the rich oily residue of the dish. Very nicely handled on all angles. 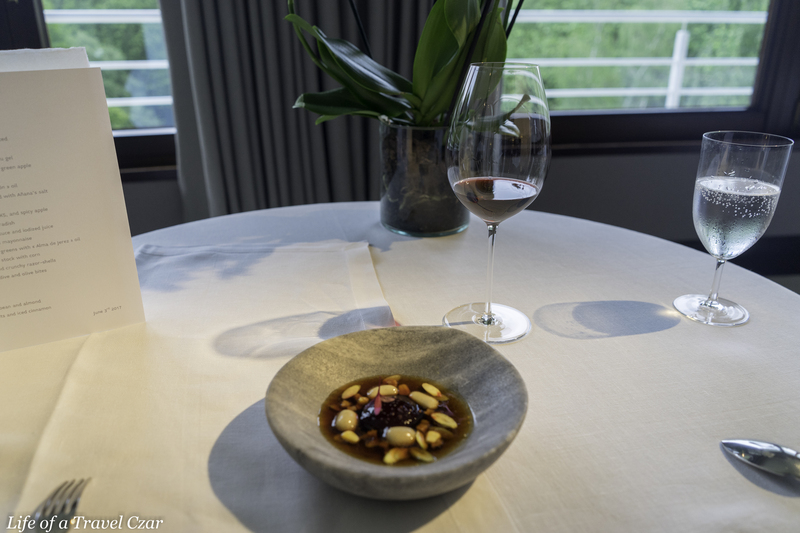 The dish is a Gallo Celta Galician egg poached in beetroot, with a rich chicken and lemongrass stock with truffle potatoes (which are spherical constructed as capsules – hard on the outside and liquid inside), corn and pieces of sausage. The richness and flavour of the yolk is something to behold, its met with an equivalence of the strength of the chicken stock. 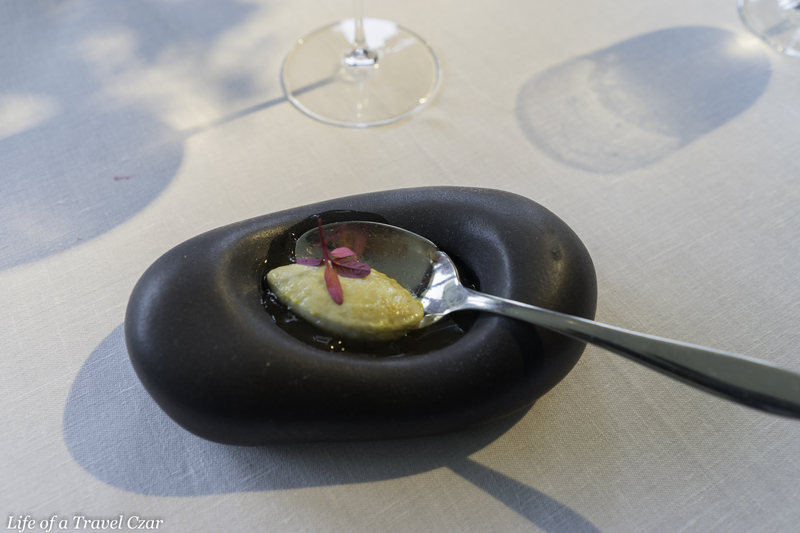 The corn adds a little crunch while the spherical potato adds a burst of flavour on the palate. Its a dish imbued in richness and strength of flavour. There is no room for mildness here. 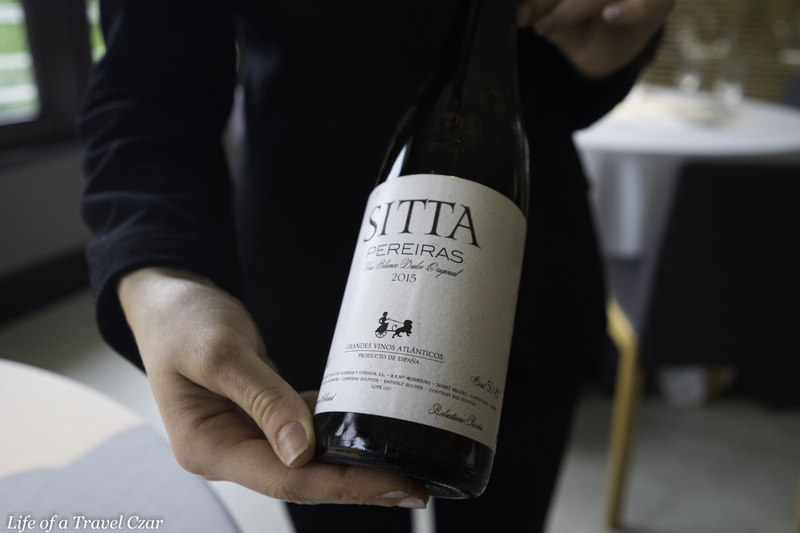 The wine is a rather interesting Mencía from Ribeira Sacra. 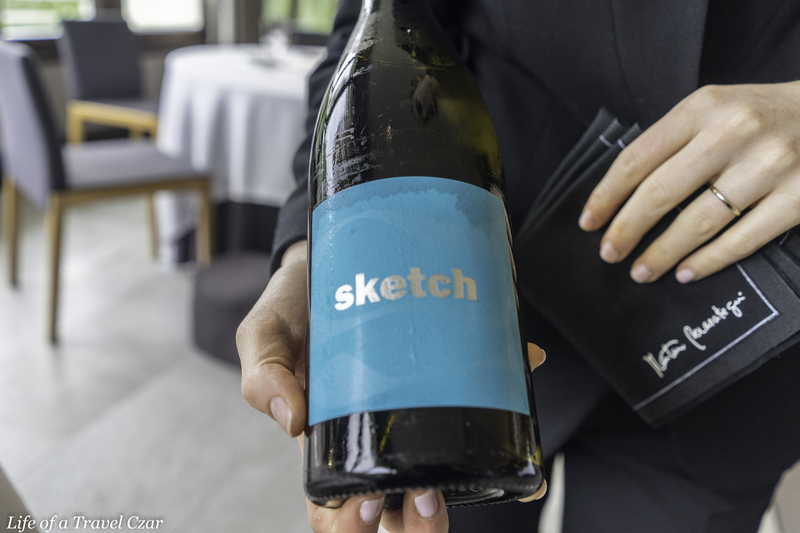 The wine is from the same producer as Sketch (one of the earlier wines I had tonight). 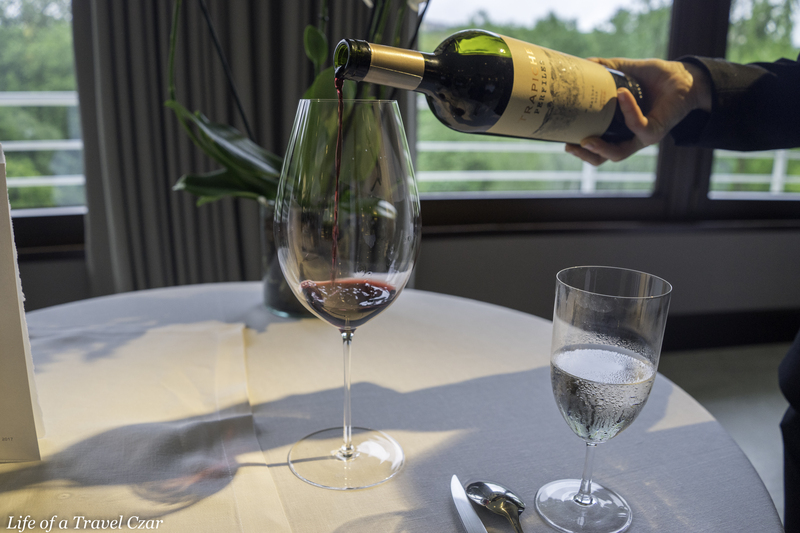 The wine is primarily Mencía with some other Atlantic grape varietals. (For those from the UK, Asia Pacific & USA, Mencía is a grape only from the Iberian peninsula). The wine has beautiful aromas of herb and blueberries. On the palate there is a good pure bluberry base which flows into notes of herb and an interesting bitter / sour salinity in the finish which lingers (presumably this has something to do with the altitude). The wine has very fine tannins and the fruit base is supplemented by good acidity. It’s arguable whether the dish needed a pairing given its strength on its own. The wine was soft enough; cognisant of the chicken stock but with enough strength for the egg and truffle potatoes. The salinity and sourness in the wine’s finish did provide another dimension to the taste experience and the palate cleansing tannins were a lovely help with each mouthful. The pairing proved a decent experience. This is one of those really interesting combinations and culinary constructions. There is shrimp spider web (reminiscent of a good tortillitas de camarones) placed on top of the hake. The hake is wrapped in Iberian pork with green Thai curry (coconut milk, coriander and clams) with a roasted tomato and vodka foam and fennel cream. The succulent hake is a dream with the Iberian pork infusing the right level of salt for a lovely taste experience. The green curry has a richness from the coconut milk and aromatic spice, which embodies the salinity of the clams. The clams have a slightly slimy texture to them. The foam is a very light flavour notwithstanding the vodka’s presence and the fennel cream proves mild. The shrimp spider web is crunchy adding some nice contrast to the dish and the deep salty shrimp flavour is able to compete for its place in the dish. This is a dish about natural flavours (hake, pork, clams) and wonderful seasonings and spices which each harmoniously flow together. The wine is a Syrah from Spain. The vinyards are c.1,000 metres above sea level and planted on calcareous soils. The wine has some wonderful aromas of ripe cherries, cassis and black fruit notes with a hint of aromatic spice. 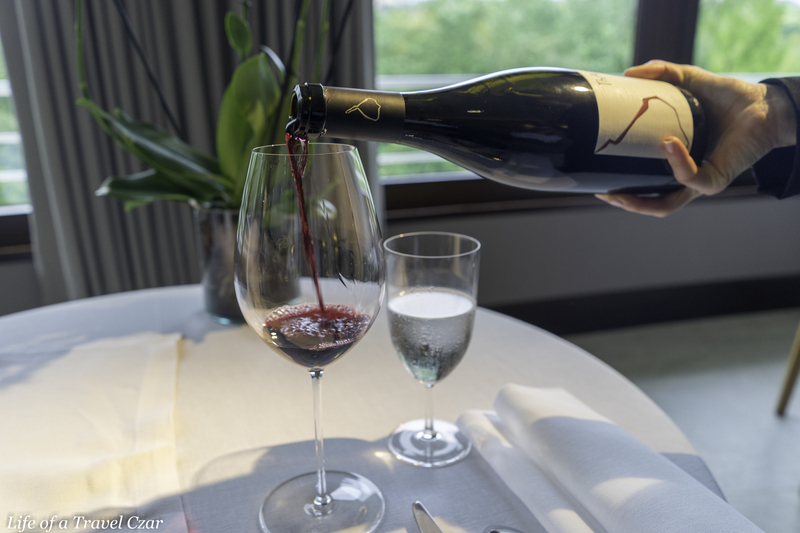 On the palate there is the good backbone of cherries with a beautiful minerality, strong acidity and very silky tannins which flow into a mildly saline and spicy finish. The aromatic nature of the wine is perfect for a curry – the two are a wonderful back forth for the nasal senses. 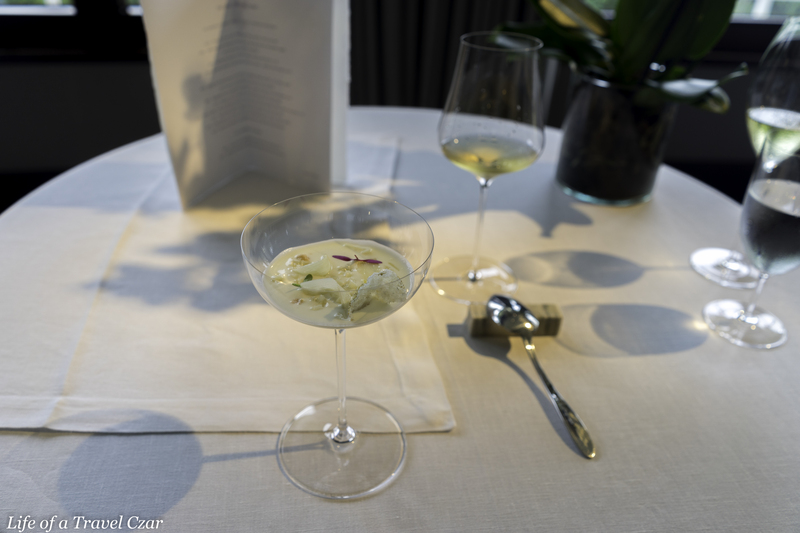 In terms on the palate; the spice notes of the wine nicely meld with the spice and flavours of the curry. The fruit was good to balance the salinity of the pork and clams as well. The dish is more classic in a sense; there is the beautiful roast pigeon, pork tail with black olive, foie gras, lemon curd, black cherry marinated in sherry, pigeon liver and some green beans. 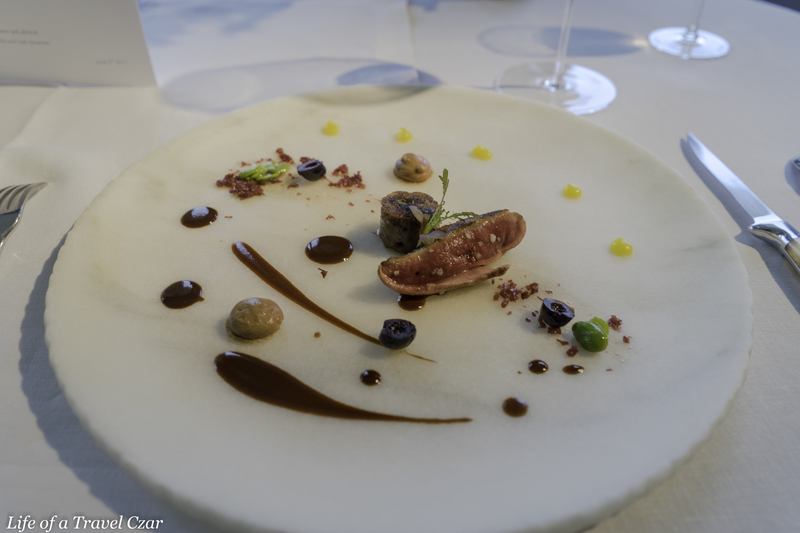 The salty pork tail and rich olives are treat and can stand on their own against the rich gamey flavour of the pigeon. The pigeon is beautifully charred on the outside with smoky flavour and rare / juicy in the middle. The sweetness of the black cherries are a classic fruit and game pairing. 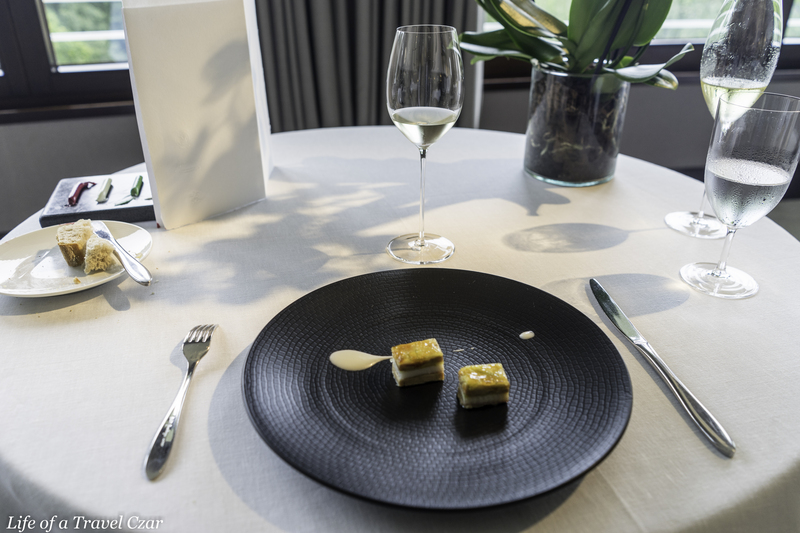 The foie gras adds of level of richness to the dish, which is nicely balanced by the tart lemon curd gels. The pigeon liver is a beauty and I ensure its scooped with most mouthfuls. The wine for this pairing is an Argentinian Malbec. 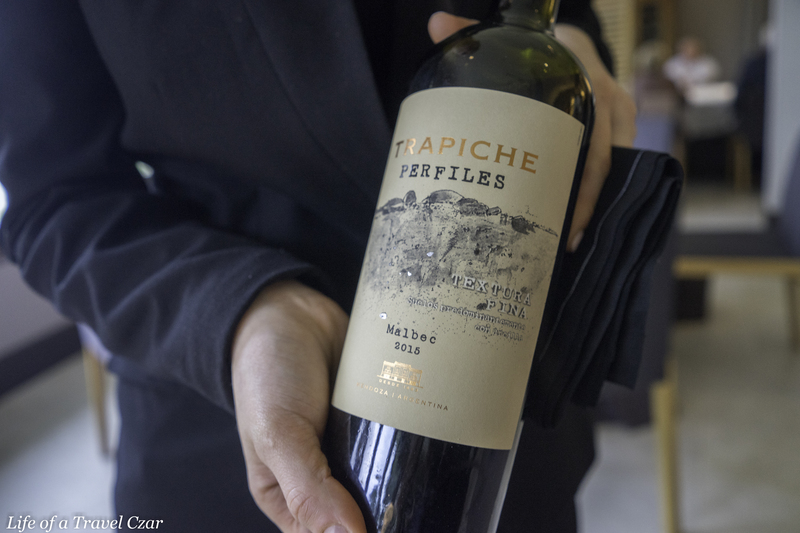 The Malbec is planted in clay soils at high altitude, which means the vines need reach deeper for their water resulting in a fuller richer fruit. The Mabec has a lovely oak on the nose. There are also hints of black fruit, mint sweet spice and light earthy notes. On the palate its very much blackberry flavours with hints spice, mint and chocolate in the finish. There are good earth notes and decent chalky tannins which make for a good mouthfeel. The choice of a Malbec is interesting. 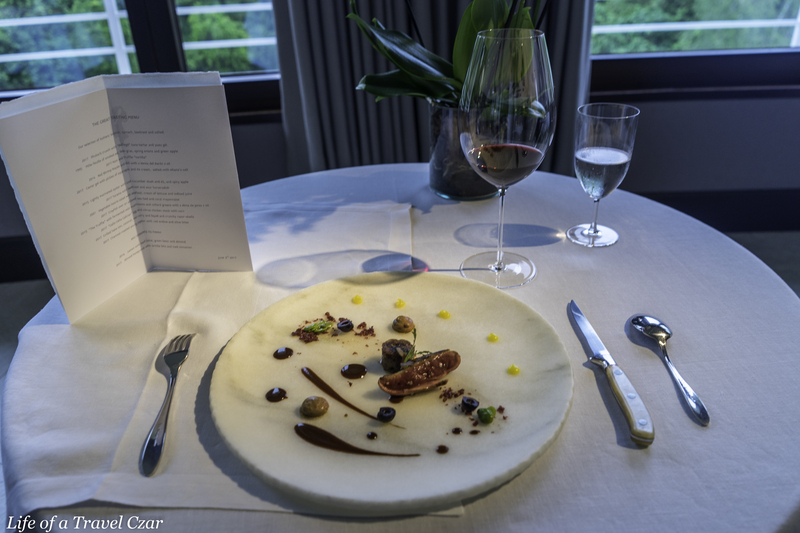 The pigeon has a game feel to it which requires good fruit, but there is the pork and other richer elements of the dish. I think the wine strikes a good balance of strong deep fruit flavours for the game and tannins as well as other earthy notes to pair with richer items of the dish. Its perfect for the variety of ingredients in the dish. It looks like lemon in the middle, but it is actually lemon cream in white chocolate shell (coloured green), basil juice, gin sorbet and lemon peel cream on the side and green beans across. A quick whack with the spoon breaks the white chocolate shell and the cream spills into the plate. 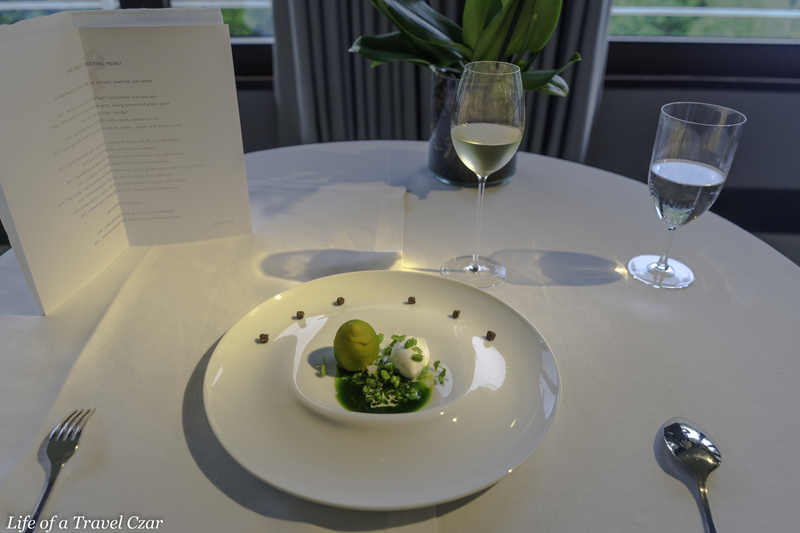 The lemon is tart, the basil has a lovely fresh herby flow to it, the gin sorbet is cool and there is crunch of the green beans. Its a mix of colours, textures (ice, juices, cream, crunch), temperature and flavours. A refreshing dessert which also acts to cleanse the palate from the main courses. A very fresh and delicate sweet wine. 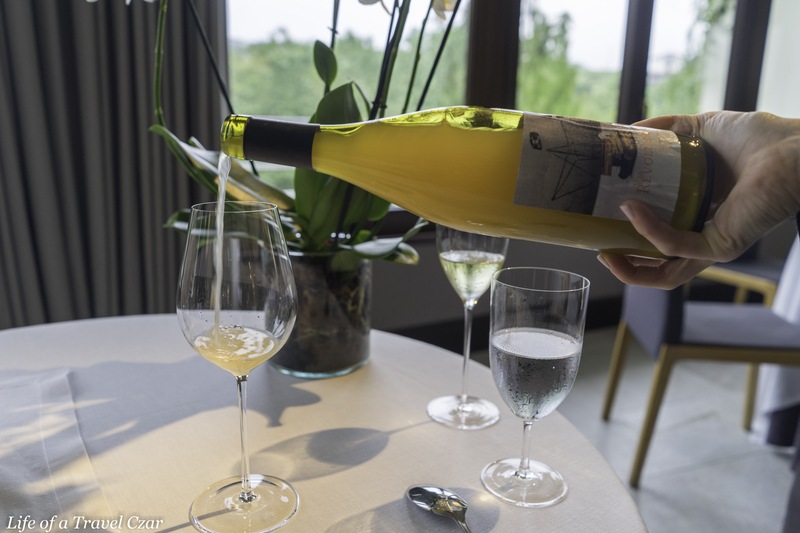 On the nose there is a light citrus aroma and on the palate the wine displays green apple flavours with good citrus acidity which evolves into a sweet finish but with the citrus tartness intact. 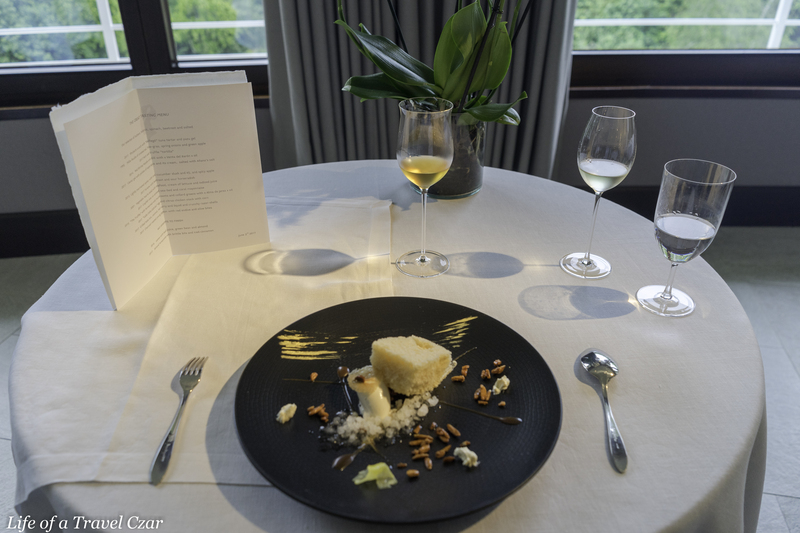 In general the pairing was nice with the citrus tartness of wine matching the tartness of dish and the lovely sweet finish the wine rounding out the dessert’s many flavours and textures for a refreshing palate cleansing experience. 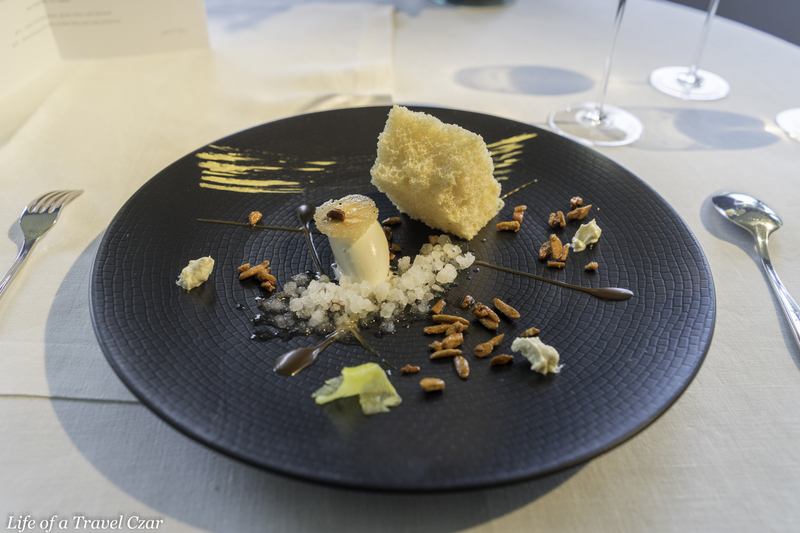 The dish is very interesting, there’s almond, white chocolate honeycomb with air, whiskey ice, cinnamon ice cream, pineapple on side and caramelised almond with butter. It’s a rich, creamy and buttery dessert balanced with the lightness of the honeycomb. Its a mixure of textures again, crunch, ice, fruit, fluffiness and cream. Quite the sensory experience and one which keeps the palate thinking even at this very late stage in the afternoon. The honeycomb was a pure dream indeed. This wine has a jammy (think of opening a marmalade jar for the first time) aroma. On the palate, the wine has a rich dense sweet (almost but not quite syrupy) flavour of candied fruits, honey and tropical notes. In the finish there is a little evolution, with ginger, spice, floral notes emerging to balance the initial sweet intensity of the wine. The honey notes in the wine are lovely in reinforcing the flavours of the dessert. 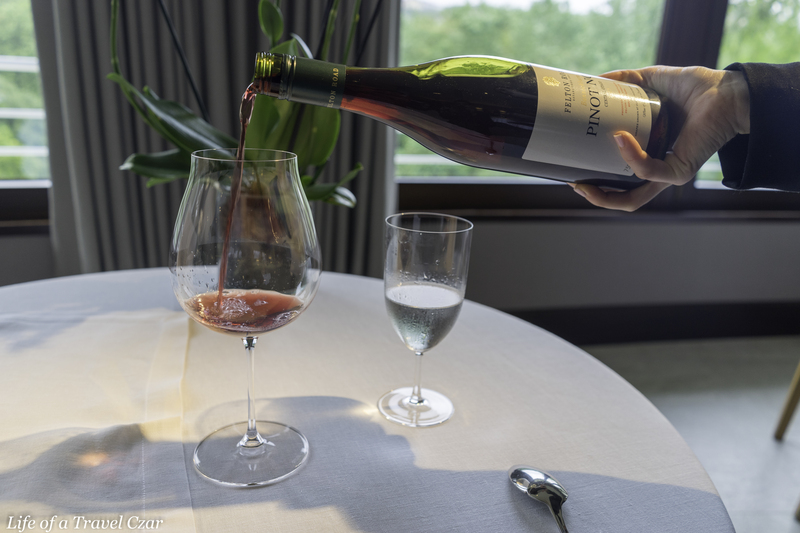 The sweetness in the wine does initially seem like an overload but as it evolves the bite of the ginger and spice flow effortlessly to balance some of the sweeter elements of the dessert. 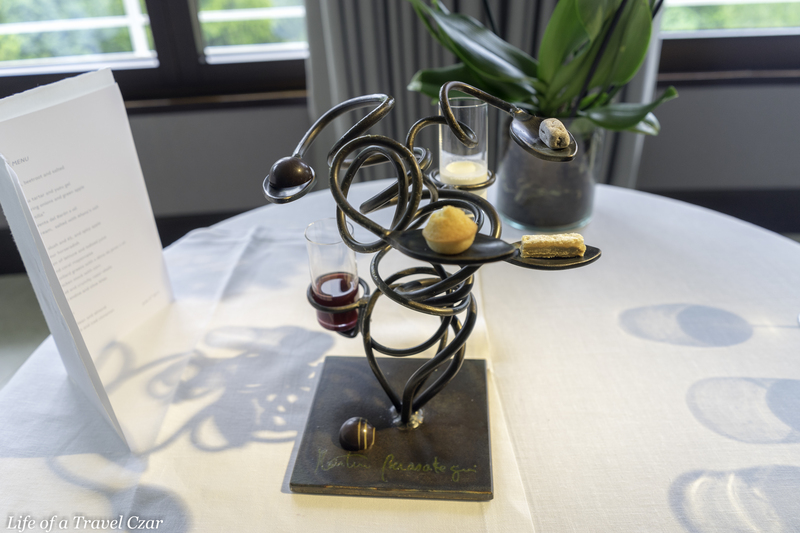 Beautiful petit fours (juices, creams, chocolate and tarts) are brought out in the finale on a lovely dessert stand. I have a coffee (which is well done) to finish and sign-off on proceedings. 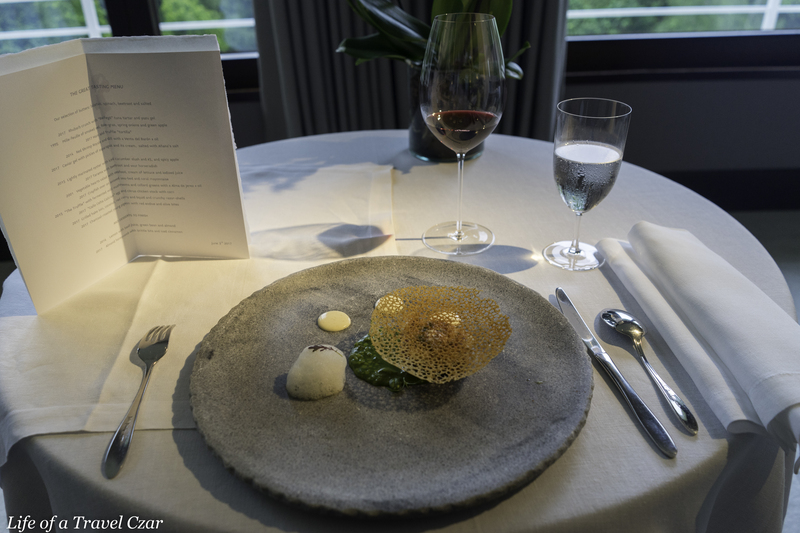 The culinary construction of each dish is thoughtful with enough weight given to quality produce, flavour interactions, contrasts (textures, flavours, temperatures) and the aesthetics of each dish was a sight to behold. 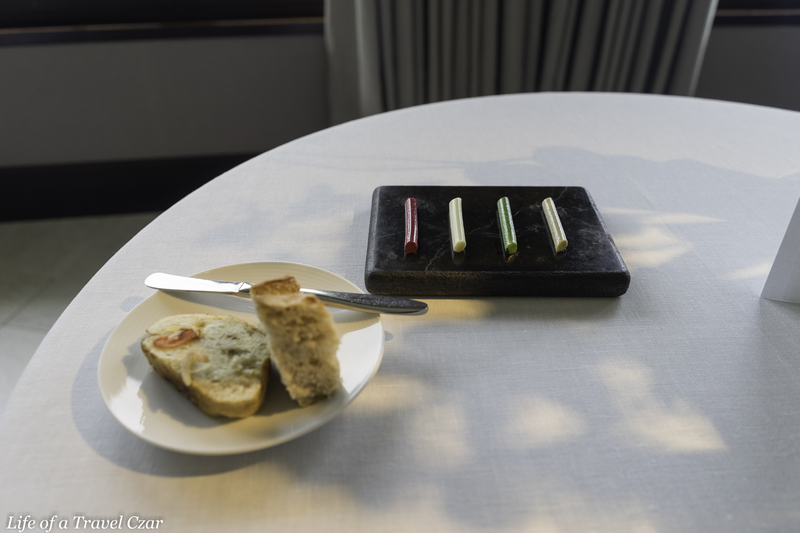 The translation from concept to execution is often an issue at most restaurants, however Martin Berasategui does not suffer from this – the execution was flawless. Then we come to the wine pairing. These are often fraught with danger as you do lose control over the experience. When I looked at the dishes, I was concerned that such complex culinary constructions would mean the wine pairing would be a little off or miss the mark in some areas. 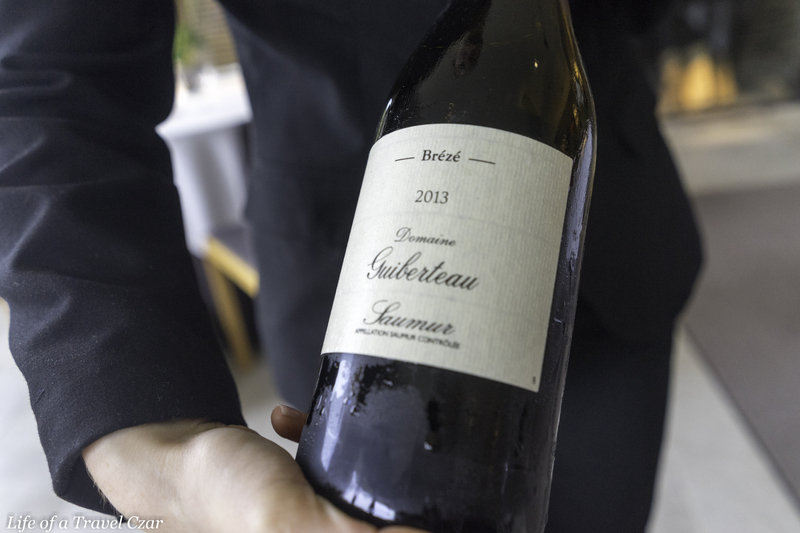 The menu requires some good gymnastics from the sommelier to find the perfect match. 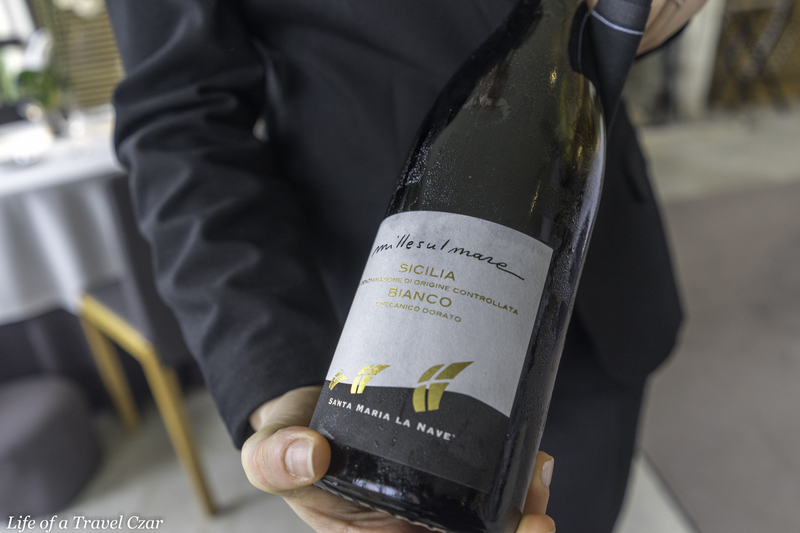 The head sommelier (Valentina) is amazing and she rises to the occasion of each dish – every wine is well explained, the thought rationale for the selection is shown and the delivery is flawless – she is a master and one of the best in the business. No item on the dish was an orphan to the pairing. It’s a masterpiece which included wines from volcanic heights to ocean depths, sherry, sake, cava. The list was dominated with Spanish wines, but some lovely drops from France, Italy and New Zealand were also included. 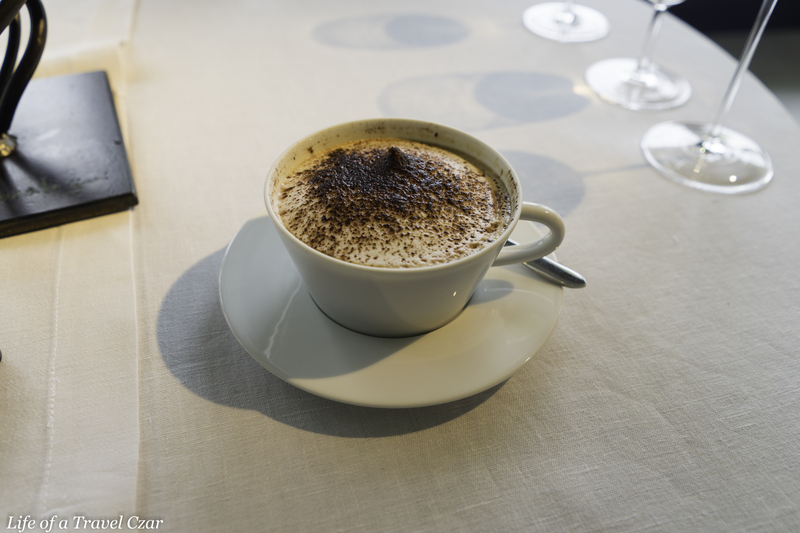 The service was flawless – all the waiters are friendly, able to answer any question and willing to field any request. Their silver service skills are impeccable – with the decline in Escoffier style cuisine this is regrettably becoming a lost art. 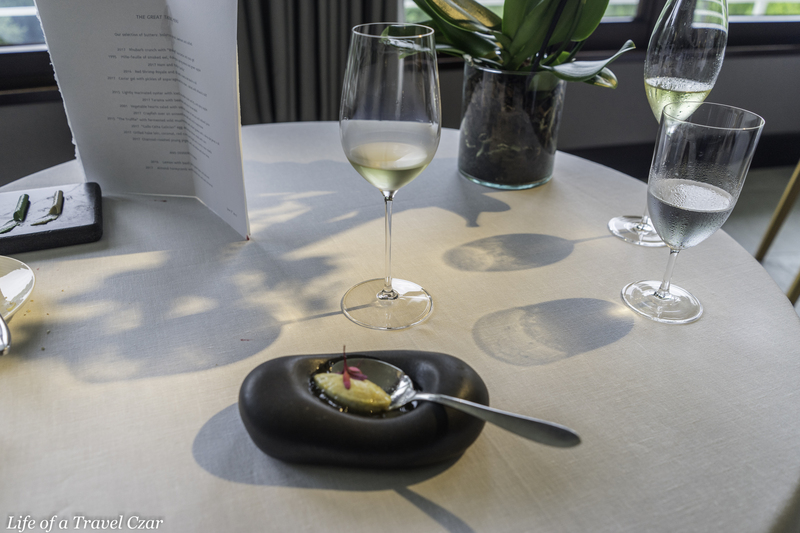 Each plate or piece of cutlery his handled with care, nothing is left empty on the table for long, the wine arrives at the right time before the next dish and there is a consistency in service which is second to none. This is dining theatre at its best. The service doesn’t end post the payment of the bill, as I leave, it starts to rain a little, just a drizzle, and I am escorted to the taxi by one of the receptionists with an umbrella held over my head. Having considered all of the above, what do I think of this 3 Michelin star establishment? Without a quiver of hesitation or reflection…. it joins the list of just a handful (five restaurants); here it is 10/10. Your write-up does justice to such a beautiful meal. Imagining this meal with the write up and with the pictures is inspirational to myself as a “foodie” and I am sure many others. Thank you for sharing. Unbelievable. Being able to walk out of a top 5 restaurant. Those moments are few and far between. Another stunning review Czar. Keep them coming. Special mention goes out to your liver on a job well done. Aww thank you! Yes, haha my liver does deserve an award after that!